BALMY vs BARMY: which is which? Top tips to remember the difference. BALMY and BARMY – these soundalike words (also known as homophones) are easy to confuse. And there’s a big difference between a BALMY (warm) summer’s day and a BARMY (crazy) summer’s day! 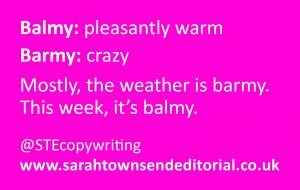 Here are my simple spelling tips to remember the difference between BALMY and BARMY. BALMY is an adjective (a describing word) that means pleasantly warm. If you’re tempted to confuse it with think L for lovely weather. BARMY is a colloquial or informal expression for mad or crazy.